The co-founder of the Caring Homes Group has been applauded for her efforts within the sector by being presented with an industry accolade. Caring Homes Group co-founder Helena Jeffery was presented with the award for ‘Outstanding contribution by an individual’ at last week’s Health Investor Awards 2018. The Health Investor Awards, which promote excellence and recognise innovation as well as those driving improvement in the independent sector, has become one of the biggest events of the year for the health industry and more than 1,200 people attended the ceremony at London’s Grosvenor House Hotel. Jeffery, a registered nurse, worked as a nursing home manager ahead of starting Caring Homes with her son Paul in 1994. There are now more than 60 Caring Homes supporting older people with residential, nursing or dementia care across the UK, Scotland and Channel Islands. The Consensus arm of Caring Homes Group offers supported living for people of any age living with a Learning Disability and/or other complex needs. 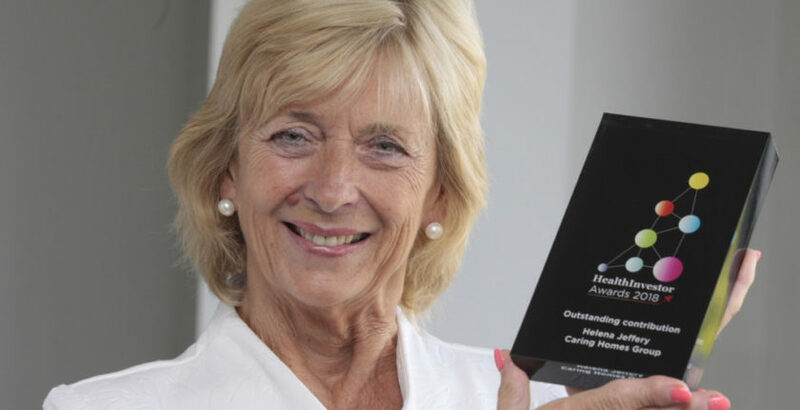 Her work was first acknowledged at the care industry’s Care Training Excellence Awards with ‘The Dame Vera Lynn Lifetime Achievement Award’ and most recently the ‘Lifetime Achievement Award’ at the prestigious National Care Awards in 2016.